A similar story is played out in NHS EDs every Friday and Saturday night. From the early evening onwards, scores of drunk people are brought in needing treatment for injuries or intoxication. Research published by the Emergency Medicine Journal suggests as many as 15% of ED attendances are related to alcohol, rising to more than 70% on Fridays and Saturdays. The problem has got so bad that NHS England chief executive Simon Stevens has suggested drunk tanks – or safe spaces as they are sometimes called – may need to be set up across the country to keep revellers out of EDs, highlighting the success of them in places such as Bristol and Cardiff. He spoke out after spending time with NHS staff in London and the West Midlands during the festive period who were having to deal with ‘drunk and often aggressive people’. Drunk tanks are not new. They have in fact been about for years, popping up with increasing regularity over the past decade or so. A study published in December by the Portman Group, the drinks’ industry responsibility body, identified 45 schemes across the UK. These come in all shapes and sizes – 60% operate from vehicles, such as buses and lorries, while the rest are run from buildings. Some involve creating spaces where people can charge phones, rest and rehydrate and are staffed by volunteers, while others are effectively mini-medical units with trained nurses and paramedics on hand to offer treatment. The schemes highlighted by Mr Stevens are at the latter end of the spectrum. Bristol’s service operates out of a converted 60-foot articulated lorry. It is known officially as an alcohol recovery centre and has beds, seats and two showers. It comes equipped with medical drips, oxygen, blood testing equipment and a pump for the worst-affected revellers. In Cardiff, the project is run out of a building and staffed by emergency nurse practitioners and healthcare assistants. It started in 2013 and is proving a ‘major success’, according to senior emergency nurse Wayne Parsons, who runs the service. 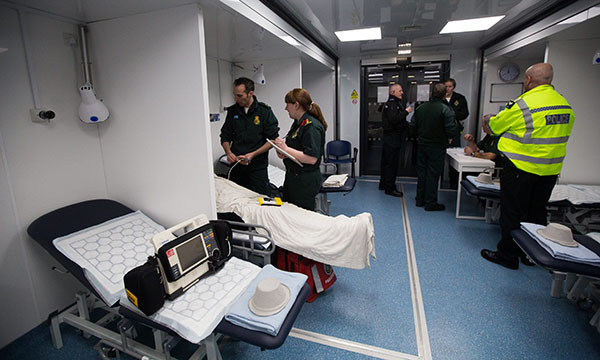 ‘It has greatly reduced the number of alcohol-related cases in local ED units and meant that emergency staff can focus their care on those that really need it. We believe it has had a real impact on patient care and safety,’ he says. Figures from 2015 show only 15% of those who needed help from the service had to be referred to hospital. Jo Cox-Brown, founder of Night Time Economy, a consultancy which works with councils, the NHS and police to create safe spaces, believes having people with clinical knowledge is vital. But she also says it is important to work in partnership, particularly volunteers like street pastors who can help bring people to the safe spaces and sit with them while they are there. Manchester set up a drunk tank over the Christmas and New Year period. The welfare unit was run over six nights from a converted shipping container in the city centre and saw 190 people. It was staffed by volunteers with an ambulance technician and first responder there to deal with health problems. A private ambulance was also on hand to ferry patients to ED when required so the service did not have to rely on the ambulance service. The unit was a joint initiative between the council and local police and was funded through money seized from criminals under the Proceeds of Crime Act. Each night it was run, the service alerted the police, ambulance control room and local EDs that drunk revellers could be referred there. Local security firm Radius also provided staff to support the unit. The volunteer Village Agents, who patrol the streets at night, were also on hand to take people to the unit. Of the revellers that were seen, 30 were given some form of medical attention at the unit that would usually have led to a hospital visit. Another six had to be taken to an ED. Manchester estimates this potentially saved the NHS in the region of £128,000 in hospital treatment, while the fact a private ambulance ferried the six patients to hospital represented a £12,000 saving. In terms of saving police time, the impact was put at over £17,000. The cost of providing the service was just £3,800 by comparison. The city is now considering running it on a permanent basis during popular drinking periods. This is echoed by the Portman Group research. It found for every £1 spent, £9.31 would be recouped through savings to the public sector. For the NHS alone, the saving could be in the region of £100 million a year. But it said they had yet to reach their ‘full potential’, believing there was scope for another 110 schemes across the UK. However, RCN emergency care association chair Janet Youd urges caution. ‘Intoxicated patients are a huge challenge for EDs. They can be incredibly disruptive, abusive and hard to deal with. But I don't think the answer is simply stopping them coming. ‘Head injuries are common, but they can be difficult to spot. People with diabetes can seem intoxicated when really they are hypoglycaemic. ‘There can also be all sorts of social issues tied in with drinking. I’ve never come across a case of child sexual exploitation that did not involve alcohol or drugs in some way. Alcohol can often be a factor in domestic abuse too. In terms of getting NHS England’s backing, much will depend on the review of drunk tanks being done by the National Institute for Health Research. The work started in early 2016 and is due to be completed this summer. But even if they do get backing, who is going to pay for them? The Portman Group report showed running costs ranged from £5,000 to £150,000 a year. The police and local authorities were the major funders, not the NHS, but with budgets limited there has to be some doubt whether finances can be found for more.